Some anti-choicers with a little tech know-how have made the Wikipedia page for "abortion" the second search result when you Google "murder." Their success is perhaps impressive, but manipulating search engine results isn't the most effective form of advocacy. The abortion-murder link is obviously a political prank — says BoingBoing's Cory Doctorow, "However you feel about abortion, this Wikipedia page is pretty clearly not the second-most relevant document regarding murder on the entire English-speaking World Wide Web." Google-bombing, or artificially manipulating Google's search results through strategically placed links, has been used for political aims before, notably when activist George Johnston managed to make the search term "miserable failure" return a link to George W. Bush's official White House page. Google made changes in 2007 to make the process more difficult, but obviously it's still possible. So is it effective? If the goal is providing a bit of amusement for anti-choicers — and making a few people on the pro-choice side mad — then whoever's behind this particular Google-bomb has succeeded. But if the anti-abortion advocates actually wanted to change people's minds, they could have picked a better venue. 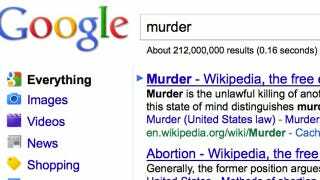 Few people are stupid enough to decide that abortion is murder simply based on a Google association — and whoever is Googling "murder" is unlikely to be looking for serious political debate. Google-bombing is also a pretty antisocial tactic, as advocacy goes — it makes search engines less useful and real information harder to access. Of course, this wouldn't be the first time anti-abortion activists used misinformation to help their cause. In this case, though, they're also harming a company's image of neutrality and accuracy. We've contacted Google to see if they're taking steps to reverse the abortion-murder link, and we await their response.